UFCW International Secretary-Treasurer Esther López is a leading champion of working men and women, immigrants, and all families seeking a better life. For decades, she has worked tirelessly to bring social and economic justice to every corner of the United States and beyond. 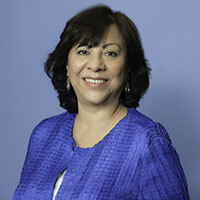 López is best known for her leadership on comprehensive immigration reform, recognizing the issue as central to civil, human, and labor rights. After President Obama announced relief from deportation for the parents of U.S. citizens and legal permanent residents, López launched a program to ensure eligible UFCW members were first in line to apply. Prior to that, she spearheaded the Union Citizenship Action program, also known as UCAN, to help UFCW members become naturalized and get on the path to citizenship. López was the lead staff person on the UFCW Commission on ICE Enforcement that highlighted civil rights abuses in the 2006 Swift raids. All along, López has never lost focus on the broader goal of giving aspiring Americans the chance to become citizens and ensuring all workers are protected from exploitation. López has also helped lead the transformation of the UFCW into a more diverse union. As part of this effort, she developed and administered two diversity surveys that asked important questions about how to make the UFCW leadership more reflective of its membership. Since López took the helm of the Civil Rights and Community Action Department, more women and minorities have been hired and promoted into positions of power. She also oversaw the launch of the UFCW’s first-ever LGBT constituency group-OUTreach. López currently serves on the national boards of the Lutheran Immigration and Refugee Service, Jobs With Justice, Center for Community Change, National Consumers League, and Labor Council for Latin American Advancement.